Clear skies, crisp light, sunny days, cool nights. Marrakech has long been one of my favourite winter destinations, since my first visit to the terracotta city from our home in Abu Dhabi almost fourteen years ago. Back then the appeal was partly the respite from the sweltering Arabian Gulf heat – along with the spicy lamb tajines, atmospheric medina streets, excellent souq shopping, and the endearing chaos of the city’s main square, the Djemaa al Fna. Here’s my Cool Travel Guide to Marrakech. Countless riad hotels have opened since, but the Charles Boccara-designed former merchant’s house Dar Les Cigognes (108 rue de Berima, Medina) was one of the first of its kind and is still one of my favourites. Courtyard with trickling fountain. Elaborate stuccowork. Intricately carved wooden doors. Rooftop garden. It ticks all the boxes. I have lots of fond memories of cosy evenings in front of the fireplace in our room sipping Meknes wine, and breakfast in the sunshine on the terrace overlooking the colossal storks’ nest atop the palace ramparts opposite. We took Mum here once too and she was also smitten with it, making it equally suitable for couples looking for romance, as for family holidays and girls getaways. Last time we tried a smaller family-owned riad called Dar Rocmarra; our review here. Whenever I visit Marrakech I seem to spend most of my time on the chaotic Djemaa al Fna, taking in the cacophony of sights, sounds and smells. If I arrive during the day I make a beeline for the orange juice vendors, otherwise, I hit the square in the late afternoon to watch the nightly ritual of stallholders wheeling their carts out to set up their mobile restaurants. I’ll amuse myself with the myriad entertainments – from storytellers and musicians to snake-charmers and henna-painters, amateur boxing matches to bowling games with Coke bottles, along with the ubiquitous fortune-tellers. When the ground level action becomes too much I take to a ‘panoramique terrasse’ to watch the spectacle from a safe distance. Then, when I’m feeling peckish, I hit the square again to tuck into dishes of tasty escargot (I like stand #6), hearty harira soup (stand #5) and pungent spice tea made from ginseng, ginger, and cinnamon, served with spice cake and a sweet smile. Shopping in Marrakech is magic. While there are plenty of fabulous shops all over the city and new shops opening all the time, the souqs will always be where it’s at for me. I’m fond of Rue Dar El Bacha, dotted with some of the medina’s finest shops, such as Siwa, Khalid Art and Zimroda Arts, which specialise in antiques, beautiful Berber jewellery, Oriental carpets, and exquisite decorative objects. It’s also the address of several fondouks, North Africa’s equivalent of the Middle Eastern caravanserai, which house artisans at work crafting and selling their wares, from hand-woven tapestries to leather bags and ottomans. I especially like Fondouk Al Amri for the tile-makers and woodworkers who make wooden mashrabiya screens. Derb Mouassine is home to stunning shops selling contemporary stainless steel, pewter and tin mirrors, lanterns and even clawfoot bathtubs while Rue Sidi El Yamami has a handful of shops specializing in silver jewellery, including flamboyant gem-encrusted rings, pretty bangles and pendants, and earrings, amulets and charms bearing the Hand of Fatima (khamsa). You can spend hours exploring Rue Fehl Chidmi and Souk Laksour alone, where you’ll find leather ottomans, Moroccan kilims, colourful babouches (traditional pointy slippers), glass perfume bottles, tinted tea-glasses, conical ceramic tajine pots, and sequinned cushion covers and bedspreads. If you’re keen to design lanterns, candelabra, or even a four-poster bed, make a beeling for Place des Ferblantiers, the Blacksmiths Square. Also head to Grantourismo for my shopping themed walking tour. I love tucking into traditional Moroccan food, especially in winter. It takes an awful lot of couscous and tajine before I feel the need to resort to French or Italian. For lunch, I’ve always liked sinking back onto a banquette at Terrasse Epices, slap-bang in the souks, for pigeon pastilla and panoramic views over the medina rooftops. For dinner, there are few better spots for a romantic meal than the atmospheric Dar Yacout (79 Sidi Ahmed Soussi, Medina), which takes the idea of the Moroccan feast to the extreme. The evening starts with the hypnotic rhythms of Gnawa musicians in a candlelit room to a banquet fit for a pasha before finishing with scrumptious pastries and mint tea poured dramatically from great heights. My other favourites include Le Foundouk (55 Souq el-Fassi), a stylish restaurant in a majestic riad, serving up delicious Moroccan and French to a moody soundtrack and buzzy French brasserie Grand Café de la Poste (Ave Imam Malik, Ville Nouvelle) in a 1920s mansion, which oozes colonial charm with its potted palms, rattan chairs and ceiling fans. Order bubbly, oysters if they’re in season, and steaks and fries. Whether you’re escaping the chaos of the souqs or the sticky heat, Dar Cherifa is a wonderful spot to while away a couple of hours taking in an art or photography exhibition, snooping around the library, sipping mint tea, or simply taking in the gorgeous architecture of this grand riad. My go-to spot for a sip of something after a souq shopping jaunt is the rooftop of Café Arabe (184 rue Mouassine, Medina), with its vistas of slender minarets and ramshackle riads although my all-time favourite spot to sip glasses of vino under a starry sky has long been the alfresco rooftop bar of Kosybar in an old riad overlooking Place des Ferblantiers. If it’s a chilly night, you can stay inside, where you’ll often find a live jazz band in the downstairs bar, but I prefer braving the cool winter air breezes, or in the warm months, the balmy breezes, just to be able to count the stars. Sigh. From Dubai, we always flew Emirates to Morocco, although from Europe there’s the advantage of the low-cost airlines. For cheap flights and packages to Marrakech it’s worth taking a look at sites like Dealchecker.co.uk which I like. If you’re in Spain and near Algericas and feeling adventurous, consider taking the ferry across the Gibralter Strait to Tanjier and then taking the train down to Marrakech. The Man in Seat 61 site has detailed information on catching the train and ferry between Spain and Morocco. 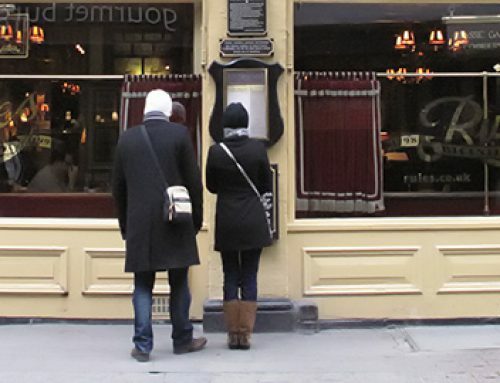 Don’t judge a guidebook by its cover: but should you judge it by its brand? I still dream of going to Marrakech. My big regret was not going when I was traveling around the world. I can only imagine how wonderful it would be to walk through the markets at night. So alive and exciting. Thanks for the tips….one of these days I will get there. 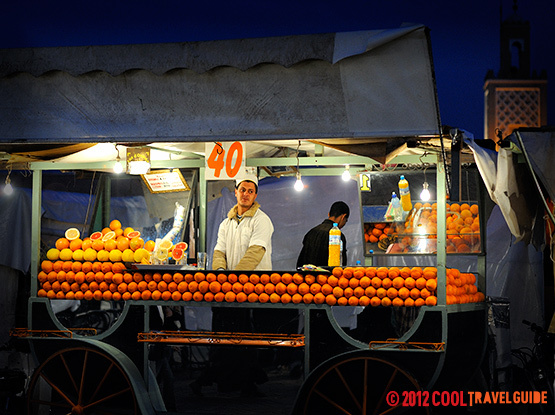 Hmm, I miss the fresh orange juice stands! A great way to finish off a hot day of walking around and checking out the place! They’re wonderful, aren’t they? Think it’s all the sunshine, but the oranges are just so sweet there. Yum!